Since my husband is Colombian and from Bogotá, he is more than familiar with this absolutely fantastic dish – I, however was not. So on our recent trip to Northern California, we cooked some lomo al trapo together at our friends Rob and Francesca’s house. It is traditionally a Colombian dish and is a beautiful large piece of beef tenderloin. Lomo = filet, Trapo = rag or cloth, so Lomo al Trapo = beef tenderloin in cloth! I forgot our camera, so our pictures are not great this time. …sorry! Fresh herbs are always key, you can choose your favorite ones – they don’t have to be rosemary or thyme, just as long as they are fresh and you love the taste. First, place the cotton cloth diagonally, corners pointing toward you, onto your counter. Pour the salt on top of the cloth to form a layer 1/4 – 1/2 inch thick that extends to about 1 inch of the edge of the cloth. Place herbs onto salt. Lay the beef tenderloin on top of the salt at the far end of the cloth and roll the cloth and salt around the tenderloin, starting in the far corner. You want to make a very compact roll. Now take the points of cloth at each end of the resulting package and tie them together on top of the tenderloin. Do this right before your charcoal or gas grille are ready. So now to the cooking methods. 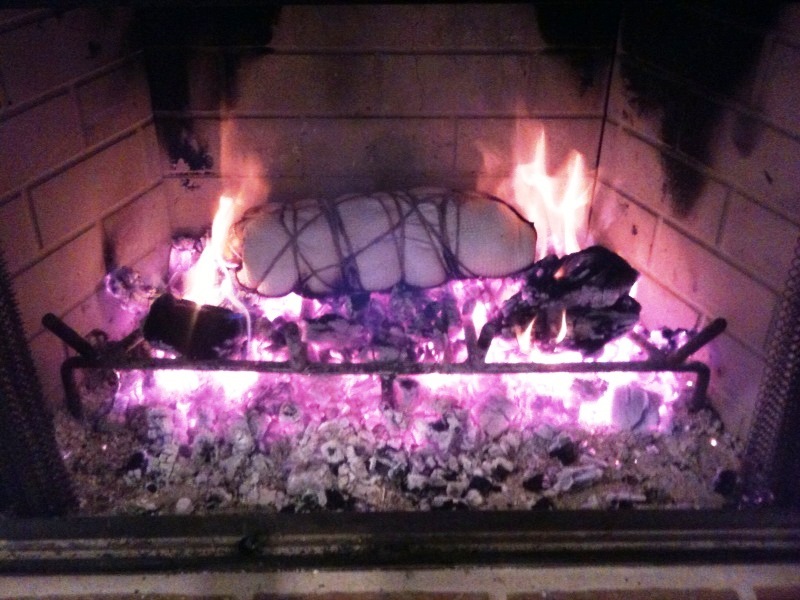 As you can see, our friends cooked the lomo al trapo in their fireplace. But you can also cook it on your gas grill. Light a fire with some wood, burn it down until you have beautiful embers, and lay the wrapped tenderloin right on the wood cradle, knot side up. Let it cook in the fireplace for about 40 – 50 minutes for a tender red middle – turn it a couple of times within that time frame. The cloth will burn and yes you’ll see some flames, but that is ok, it’s meant to. The whole thing will look like a burnt log, but not on the inside. It really is amazing. Once it’s done 40 mins for rare plus, carefully remove it and cut the cloth open. Slice it and serve. It is so incredibly smooth, soft, tender…amazing. You have to taste it to be able to describe it. Oh, and let’s not forget the amazing flavor. Heat your BBQ/grille as hot as possible. 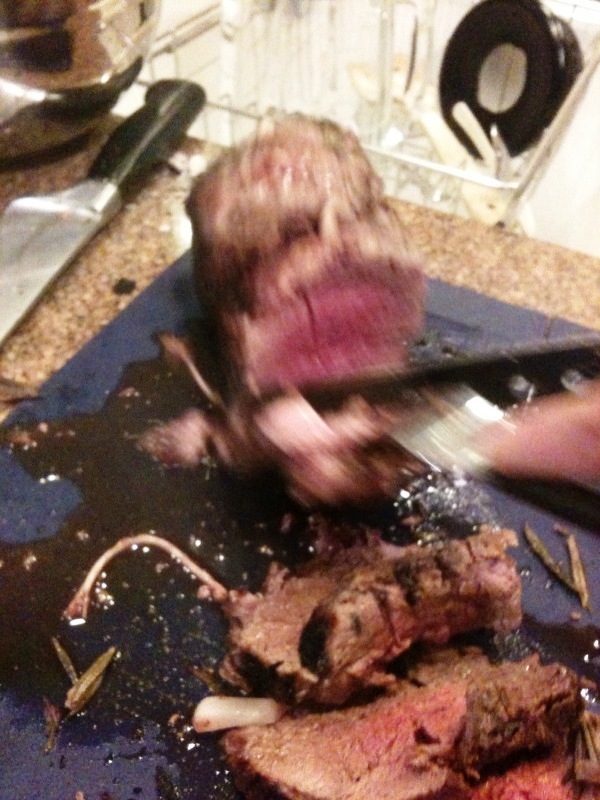 Arrange the cloth wrapped tenderloin on the grate, knot side up. Grill until the bottom is charred black, about 18 – 20 minutes. Cover the BBQ! Turn the meat log over and grill until the other side is jet black and remove. Should roughly be about the same amount of time. 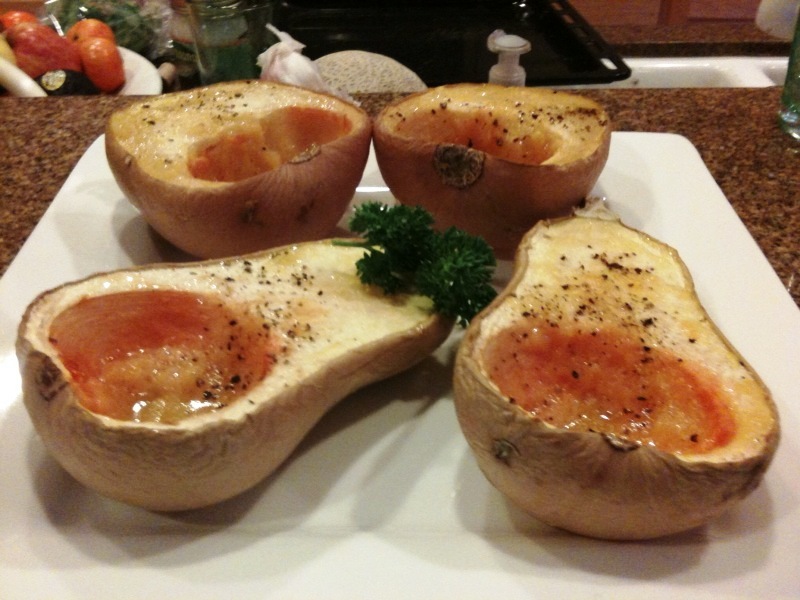 We served it with Butternut Squash boats, and yesterday’s post of bell peppers with Bacon Swiss Chard. Lomo al Trapo is one of my new favorite dishes of all time! 2 replies to Lomo al Trapo! grass-fed, of course! Oh, and it tastes like nothing that I have ever had! 🙂 really – really good!